Knighton is a small market town on the border of Radnorshire and Shropshire, standing on the banks of the River Teme. The great bulk of Knighton and the heart of the town are in Radnorshire but it has spilled across into Shropshire, in which part are some residential streets and the railway station. The town's English name, Knighton, is from the Old English cniht tun meaning "knight town", though in Old English a "knight" may be a knight as is familiar today or an armed retainer, or just a youth. The name implies that the town was founded as the result of a grant of land from a thane to his retainer. The Welsh name, Tref-y-Clawdd, is unrelated and means "town on the dyke", referring to Offa's Dyke, on which the town does indeed stand. Knighton is remote from the great towns, but a centre for the villages of Radnorshire and Shropshire around it. Knghton itself is best characterised as a nucleated settlement centred on the clock tower with limited ribbon development along the A-roads. The River Teme runs across the northern edge of the town and marks the border with Shropshire. There is but one bridge, on the A488, and across this bridge in Shropshire lie some of the town's houses and its station. The land hereabouts is sparsely populated characterised by a hilly plateau cut by narrow river-valleys with a broadly east-west axis. To the west, ground rises steeply towards Radnor Forest, and to the north, more gently, to the summit of Clun Forest. Turning east, the elevation falls gently to the Shropshire Plain. To the south of the town stands Llan Wen hill. Knighton rests on Ludlovian rocks of the Silurian period and is at what was the southernmost edge of the ice-sheet during the last ice age. Of Knighton's foundation and earliest history we know nothing. The neighbourhood does though bear evidence of ancient days: two miles away towards Clun lies Caer Caradoc, an Iron Age hillfort traditionally associated with King Caradoc (Caractacus) who fought the Romans. Watling Street, a Roman road, passes a few miles to the east at Leintwardine. A well preserved section of Offa's Dyke runs by the town. Intriguingly, Wat's Dyke also runs parallel to Offa's Dyke and a few miles to the east. An earthwork that runs north-south along the English/Welsh border from Basingwerk near Holywell to Oswestry. The dykes aside, two Norman castles, built in the 12th century, are the oldest survivors in modern Knighton. The town became a borough in 1203, with a charter permitting a weekly market and annual fair. The castle was besieged by Owain Glyndŵr in 1402 and the castle and much of the town were destroyed. The major battle of the rebellion was fought at Pilleth (Welsh: Bryn Glas), 3 miles south of the town in the same year. The town's church dates from the 11th century, but much of it was rebuilt in the 19th century. It is one of only two in Wales dedicated to Edward the Confessor, the patron saint of England before the Crusades introduced St George. The place of the town between England and Wales was finally resolved 1535 by the Laws in Wales Acts 1535. Knighton first prospered as a centre of the wool trade in the 15th century and was later an important point on the two drover routes from Montgomery to Hereford, and from London to Aberystwyth. Otherwise, Knighton was remote from the centres of commerce. It seemed likely that the railway revolution would also fail to reach the town; the 1840s and 1850s saw considerable railway building right across Great Britain but Radnorshire had a small population and little industry. The construction of the railway was made economically viable - just - by an entrepreneurial drive to connect the Mumbles and Milford Haven with the cities and factories of the industrial Midlands. The Knighton Railway Company was formed by local landowners and businessmen to build a line from Craven Arms to the town. Work began in August 1858 and the line reached Knighton in March 1861. The station itself was built in 1865. To mark the accession of H.M. Queen Elizabeth II in 1953 the initials "ER" were planted out in deciduous trees within an evergreen forest on the hill to the north of the town. On the last Saturday in August the town holds its annual Carnival and Show, which attracts thousands of visitors to the town from all over the world. It features two parades, one at midday, and another at around 8 pm; these consist of various themed carnival floats and a parade in fancy dress. The show takes place at the town's showground at Bryn-y-Castell; also home to Knighton Town FC, Knighton Cricket Club and Knighton Hockey Club. Within the town are the visible remains of two early castle mottes. One at Bryn-y-Castell and the other hidden behind the fire station and in a private garden. Just outside Knighton and visible for many miles, is an observatory with a telescope, Europe's largest camera obscura and a planetarium. The observatory is part of the "Spaceguard UK" project which searches for asteroids that might threaten the earth. The Clock Tower, similar to those in Rhayader, Hay on Wye and Machynlleth, was built in 1872 and is a central landmark and visible in the picture above. Knighton is at the centre or the start of two National Trails; Glyndwr's Way and Offa's Dyke Path. The Offa's Dyke Association has a visitors' centre in the town alongside the site of the ceremony at which John Hunt, Baron Hunt of Llanfair Waterdine inaugurated the long distance footpath in 1971. It is a walk recommended by the Daily Telegraph. A further trail, the Jack Mytton Way, passes nearby and yet another, Wat's Dyke Way, is proposed. Knighton has served as a location for two major films. First, Gone to Earth (released 1950) and directed by Michael Powell and Emeric Pressburger used the nearby location of Pentre, New Invention. Second Best (released 1994) and starring, William Hurt was filmed, in part, in Knighton. Bruce Chatwin was inspired to write his novel On the Black Hill by a hill of the same name just 2 miles north of the town and on the road towards Clun. Chatwin stayed nearby in Purslow with friends during the 1970s. ↑ Samuel Lewis. "Killymaenllwyd - Knighton - A Topographical Dictionary of Wales (1849)". http://www.british-history.ac.uk/report.aspx?compid=47839. Retrieved 19 February 2007. 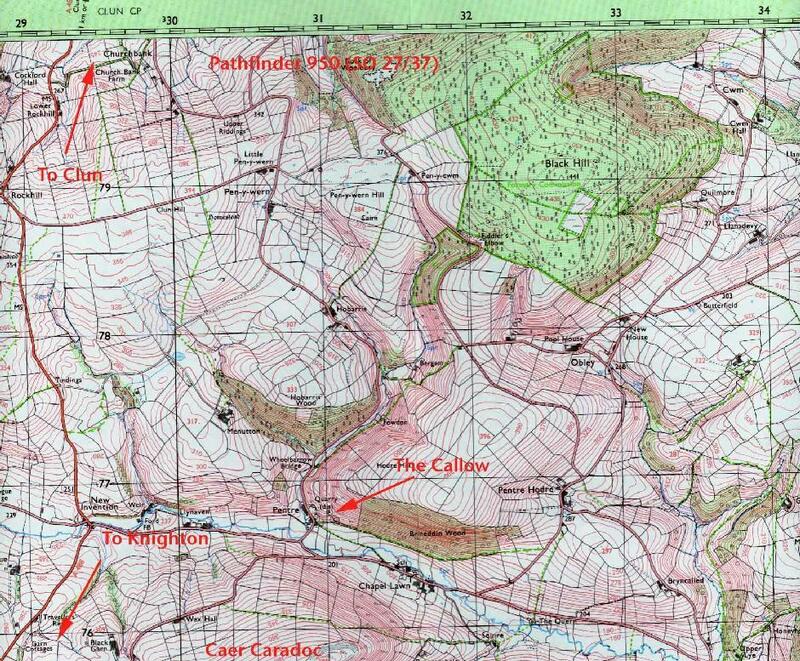 ↑ "Shropshire Geology" (PDF). http://www.shropshiregeology.org.uk/sgspublications/Proceedings/1983%20No_03%20Aug%20p21-23%20-%20Krause.pdf. Retrieved 20 November 2007. ↑ William Camden. "Chorographicall Description of the most flourishing Kingdomes, England, Scotland, and Ireland (London, 1610)". http://vision.edina.ac.uk/text/chap_page.jsp?t_id=Camden&c_id=23&p_id=820#pn_67. Retrieved 19 February 2007. ↑ "InfoPlease". http://www.infoplease.com/dictionary/brewers/wats-dyke.html. Retrieved 11 March 2008. ↑ "Knighton On Line". http://www.knightononline.netfirms.com/castles.htm. Retrieved 19 February 2007. ↑ 6.0 6.1 6.2 "Clwyd Powys Archaeological Trust". http://www.cpat.org.uk/educate/leaflets/mediæval/mediæval.htm. Retrieved 19 February 2007. ↑ Christopher Catling, Ronnie Catling. Glyndwr's Way: A Welsh National Trail. http://books.google.com/books?id=hj7bx1cQDksC&pg=PA33&lpg=PA33&dq=knighton+glyndwr+destroyed&source=web&ots=YktKeBOfZt&sig=xHzDY4lzA5IWxO8Lj8vP0f32cI4. Retrieved 19 February 2007. ↑ "AD 1535 Anno vicesimo septimo Henrici VIII c. 26". http://owain.vaughan.com/1535c26/#section6. Retrieved 15 June 2009. ↑ Samuel Lewis. "'Killymaenllwyd - Knighton', A Topographical Dictionary of Wales (1849), pp. 456-459". http://www.british-history.ac.uk/report.aspx?compid=47839. Retrieved 15 June 2009. ↑ "Powys Digital History Project". http://history.powys.org.uk/school1/knighton/train.shtml. Retrieved 11 March 2008. ↑ "Seal of the Knighton Railway company". http://www.scienceandsociety.co.uk/results.asp?image=10271139&wwwflag=2&imagepos=1. Retrieved 20 November 2007. ↑ "Go2 Shropshire". http://www.go2.co.uk/About_GO2_Pages/TheGO2GuidetoKni.html. Retrieved 20 November 2007. ↑ "BBC – comments on the carnival Project". http://www.bbc.co.uk/wales/mid/sites/knighton/pages/my_town.shtml. Retrieved 11 March 2008. ↑ 14.0 14.1 "Castle Wales". http://www.castlewales.com/knighton.html. Retrieved 20 November 2007. ↑ "SpaceGuard UK". Archived from the original on 16 October 2007. http://web.archive.org/web/20071016192726/http://spaceguarduk.com/visit.htm. Retrieved 20 November 2007. ↑ "BBC News - mid Wales". 29 January 2008. http://news.bbc.co.uk/1/hi/wales/mid/7214969.stm. Retrieved 2 February 2008. ↑ "Knighton On Line". http://www.knightononline.netfirms.com/clock.htm. Retrieved 19 February 2007. ↑ "Offa's Dyke Association". http://www.offasdyke.demon.co.uk/odc.htm. Retrieved 17 December 2007. ↑ Edwards, Camilla (4 October 2004). "Daily Telegraph". The Daily Telegraph (London). http://www.telegraph.co.uk/travel/main.jhtml?&xml=/travel/2004/10/11/etfront1010.xml&page=4#5. Retrieved 20 November 2007. ↑ "IMDB". http://www.imdb.com/title/tt0042513/locations. Retrieved 20 November 2007. ↑ "Emeric & Pressburger Fan Site". http://www.powell-pressburger.org/Trips/Shropshire/20011102/Gallery/Maps/TheCallow.jpg. Retrieved 20 November 2007. ↑ "IMDB". http://www.imdb.com/title/tt0111102/locations. Retrieved 20 November 2007. ↑ "Teme Valley". http://www.teme-valley.co.uk/knighton.htm. Retrieved 18 February 2008. ↑ Clare Balding. "BBC iPlayer". http://www.bbc.co.uk/iplayer/episode/b00t6yhb/Britain_by_Bike_The_Welsh_Borders/. Retrieved 1 February 2011. This page was last modified on 22 February 2016, at 07:29.